We’re so excited about our new Designer in Residence program for 2015! We’ve teamed up with two truly talented designers to bring you gorgeous knit and crochet designs that showcase some of our favorite Valley Yarns. This month we’re debuting the I Feel Vine Cardigan from knitwear designer Fiona Ellis and we’ll have a new design from her each odd numbered month of the year. And we’ll reveal the first crochet design from Doris Chan in February to be followed by a new design from her each even numbered month this year! This long-line cardigan worked in Valley Yarns Amherst is perfect for all seasons; cozy for the chilly months but also great to slip on over a sleeveless top in warmer months to fend off the chill of air conditioning. It’s clever use of stitch patterning utilizes the elasticity of rib patterning at the waist and cuff to give gentle shaping. The rib then morphs into a unique leaf pattern & finally into eyelet lace stitch work which adds to the overall femininity of this garment. We asked Fiona to tell us about about her process and inspiration, and to give us a bit of a sneak peek into what we can expect to see throughout the year. Tell us about your design process. Do you have design ideas in your head that inspire you to search out the right yarn or do you find a yarn and let the design grow from there? I keep an on-going archive, of sorts, for design ideas and projects that I want to work on. So mostly it’s the idea that comes first and then I search out the perfect yarn for the project/design rather than the other way around. Where do you find inspiration? Do you hike? jog in the city? take your camera everywhere you go? have a studio full of inspiring color and images? I find inspiration everywhere so I always carry a camera (or my phone) and try to bring a small notebook with me wherever I go. I find inspiration can strike at very strange times – sometimes it’s at 3am! And I find it’s a process that you can’t really command. The ideas just seem to appear of their own accord and can sometimes be fleeting or hard to pin down. So I end up with pockets full of ideas scribbled on coffee shop napkins because I forgot to bring my notebook with me that day. On the other hand I also have this mindfulness practice of taking a photo every day even if nothing seemingly exciting is happening. I’ve been doing this since Sept 2007 and have found some great ideas have emerged from this habit of encouraging myself to closely observe the world. I believe that somehow the two elements work off of each other. Tell us about your design aesthetic. What can our customers expect to see from you this year? I studied fashion knitwear design at University so my aesthetic has a lot to do with current (wearable) fashion trends in terms of garment silhouette. I have been a knitter practically my whole life so I like pattern-work that challenges me, though I do try to include sections in each project where there is less challenge, that way some parts of the project can be carried around or worked on in front of the TV (or even in a bar maybe). Tell us about your favorite Valley Yarn, is there a Valley Yarn you are excited to work with? It’s so hard to choose because they are all great and each one perfect for specific projects. So I’m going to choose Amherst for entirely personal reasons- see my answer to the next question. How did you discover Valley Yarns, what is your history with WEBS? I used to live in Massachusetts very near to WEBS, but this was in the days when I designed for ready to wear fashion houses, before I designed for the independent home knitter. I used to shop at WEBS for my personal projects but I had moved away from the area before I became intimately acquainted with the Valley Yarns. Since then I have used them when they have been selected for magazine editorials such as the designs I have done for Twist Collective, Knitters Magazine and others: Sugarbeach in Longmeadow, Blue Helix in Colrain, Athabasca in Northampton, and Paula in Stockbridge. What designers do you like/follow? Are there designs you wish you had time to knit/crochet/sew? I tend to look at couture designers and my most favorite is the late Alexander McQueen. In terms of knitwear designers that I admire, boy this is actually a long list. I admire so many of the designers working today, but if I had to pick just one I would chose Norah Gaughan. She always comes up with such eye-catching and wonderful designs, ones that I’m almost jealous that I didn’t come up with the idea myself. If I had time to knit for myself from somebody else pattern it would definitely be one of Norah’s…or maybe an Alice Starmore pattern. This entry was posted on Tuesday, January 6th, 2015 at 11:00 am	and is filed under Authors & Designers, Valley Yarns. You can follow any responses to this entry through the RSS 2.0 feed. You can skip to the end and leave a response. Pinging is currently not allowed. You could not have made a better choice of a knitwear designer!! I’ve made several of her designs plus taken courses from her. 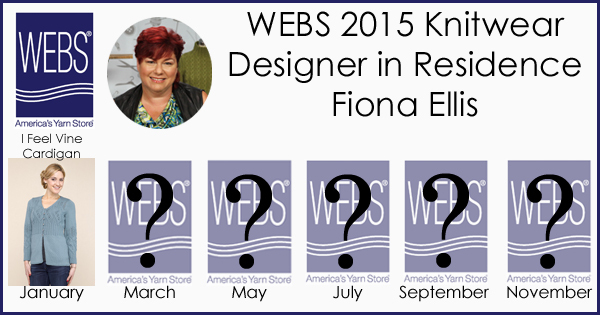 We’re pretty excited about getting to work with Fiona! Hi Shaela….thank-you so much for saying that- you have made my day!